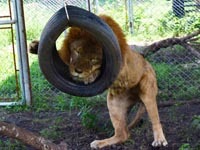 Animal Defenders International : Animal rescues : A new member of the ADI lion pride! 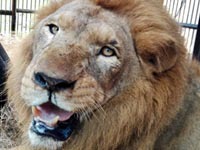 Meet Tomas, a lovely male lion, who arrived suddenly into our care in the ADI Temporary Rescue Center in Guatemala. Tomas is brother to Kimba, Sasha and Nena, and was originally with them in Circo Navarro. ADI had photographed him in the circus, but at the handover of the rest of the group, Tomas was no longer there; he’d been handed to a zoo before the circus ban came into force. In early September 2018, we were told that the zoo could no longer take care of Tomas, and we were given just 20 minutes notice that Tomas was on his way to our temporary rescue center in a travel crate! We scrambled into action and moved the lions around, so that Tomas could be placed in one of the units Kimba had been using. Since his surprise arrival at the ADI Temporary Rescue Center, Tomas has been settling in well. He loves our play area just as much as the other lions. This is the first time - in his life - that Tomas has finally been able to have some fun and it clearly feels good! As with other boys Kimba and Tarzan, the tire swing is a particular favorite! Tomas is neighbor again to Kimba, Sasha and Nena, and things will only get better from here on out, with the whole family destined for a new life in the ADI Wildlife Sanctuary in South Africa. ADI now has six lions and nine tigers in our care in Guatemala, so it is already a big rescue, but there are more animals to save. We want to save them all but we simply cannot do it without more support. Can you help?